:From creator of Veggie Tales® Phil Vischer, these fun and easy-to-read picture books based on the popular video series Buck Denver Asks... What's in the Bible? teach children about character and virtue through beloved Bible stories. 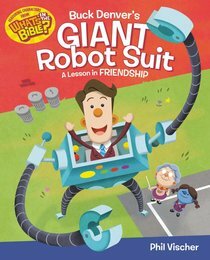 About "Buck Denver's Giant Robot Suit: A Lesson in Friendship (What's In The Bible Series)"
As co-creator of the popular VeggieTales series, Phil Vischer has served as writer, director, and voice for more than a dozen characters, including Bob the Tomato. Phil's faith-filled VeggieTales stories can be found in a third of all American homes. Vischer and his wife, Lisa, live in Chicago, Illinois, with their three children. Join puppet host Buck Denver on an animated journey into the Bible. This DVD tells the story of how the kingdom of God's people broke into two separate nations - Judah and Israel - and how their kings either followed God's rules or were disobedient to him. As always, there are miracles in store! Ages 4-8. Join VeggieTales creator Phil Vischer and his puppet friends as they search the books of Joshua, Judges, and Ruth for the answers to two more of life's BIG questions. Original music and animation make this a wonderful learning experience for ages 4-8.